"Rugby World Cup 2011" redirects here. For the video game based on the rugby event, see Rugby World Cup 2011 (video game). The games ran over six weeks, commencing on 9 September 2011 with the Opening Ceremony showcasing New Zealand's history and diverse cultures. The final was played at Eden Park in Auckland on Sunday 23 October 2011, a date chosen because it fell on a long weekend of New Zealand's Labour Day holiday. After speculation that the number of participating teams would be reduced to 16, the IRB announced on 30 November 2007 that the 2011 tournament would again feature 20 teams. Twelve teams qualified as a result of finishing in the top three in each pool in the 2007 tournament. The remaining eight berths were determined by regional qualifying tournaments. Of the 20 countries that competed in the previous World Cup in 2007, there was only one change – Russia replaced Portugal. Three nations bid to host the 2011 Rugby World Cup — New Zealand, Japan, and South Africa. 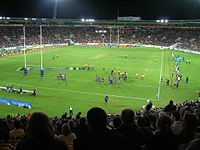 New Zealand had co-hosted the first Rugby World Cup with Australia in 1987, and had been set to co-host the 2003 World Cup with Australia before a disagreement over ground signage rights resulted in New Zealand being dropped and Australia became the sole host. The 2011 New Zealand bid contained plans to enlarge the size of Eden Park and other stadiums to help increase the commercial viability of the bid. Japan was bidding to become the first Asian nation to host the first Rugby World Cup. Japan had the necessary infrastructure already in place, by virtue of its co-hosting the 2002 FIFA World Cup. South Africa had hosted the tournament in 1995. The 2011 South African bid, led by former national captain Francois Pienaar, had strong support from their national government. South Africa had also won the right to host the 2010 FIFA World Cup. The IRB Council meeting in Dublin on 17 November 2005 announced that New Zealand had been selected after IRB inspections of each applicant host nation during June and July 2005. After winning the bid, the New Zealand Rugby Union, expressed disappointment towards their Australian counterparts who voted against New Zealand hosting the event, due to the misplaced expectation that the "Anzac spirit" would result in a vote for New Zealand. The event was expected to cost about NZ$310 million to run and to generate NZ$280 million in ticket sales. In Auckland, the city where many of the most important games took place, the costs to the local ratepayers alone was estimated at $102 million. Ticket sales exceeding NZ$285 million, accommodation-related spending of another NZ$260 million, and NZ$236 million spent on food and drink was expected to provide a significant fiscal stimulus, of nearly 1.4% of the quarterly GDP. In the years between winning the bid and the staging of the event, New Zealand news media and social agencies cast aspersions on the nation's readiness and appropriate use of national funds for sports infrastructure, as has happened with most large, international, quadrennial, multi-location sporting events of recent decades such as the 2012 Olympics, 2010 FIFA World Cup and the 2010 Commonwealth Games. Concerns were raised about the process of upgrading Eden Park to expand the capacity to the 60,000 required by the IRB. In late 2008 Rugby World Cup Minister Murray McCully said the remaining consent process might need to be overridden by legislation for the work to be completed on time. A July 2009 report by the Auckland Regional Transport Authority, released under the Official Information Act, warned of lack of readiness and complacency, despite the fact that "the levels of patron movement and operational standard [needed for the RWC] are in reality significantly above what is currently delivered." The report was dismissed by Michael Barnett, the Auckland Chamber of Commerce CEO and planning co-coordinator for RWC events in Auckland, who characterised it as a case of "a Wellington media organisation us[ing] an outdated report". The nation's largest hospitality workers' union, Unite, which represents 25% of hotel, restaurant and casino workers in New Zealand, demanded that workers share in windfall profits and said there was the possibility of a strike during the tournament. The construction of Dunedin's Forsyth Barr Stadium, known during the tournament as Otago Stadium, was a source of concern as the project was operating in a tight time frame. An April 2010 progress report stated that the project remained on target for completion prior to the Rugby World Cup, although there was a medium level of risk with some significant and potentially damaging concerns. If the project had not been completed on time, organisers would have reverted to Carisbrook as the backup option. Forsyth Barr Stadium was officially opened on 6 August 2011. Damage caused by the 2011 Christchurch earthquake forced the relocation of a number of cup matches, including the quarter finals. The 2011 Tri Nations Series was shortened to include only six games instead of the usual nine. It served as the primary preparation for the tournament for Australia, South Africa and New Zealand. In the northern hemisphere, a series of friendlies played in August 2011 replaced the annual tours to the southern hemisphere. North American entrants Canada beat USA in two warm-up friendlies in August 2011. Twenty teams competed in the 2011 World Cup. Twelve teams qualified by finishing in the top three of their pool in the 2007 Rugby World Cup. Twelve of the nations at this tournament had competed in every previous Rugby World Cup – Argentina, Australia, Canada, England, France, Ireland, Italy, Japan, New Zealand, Romania, Scotland, and Wales. All the other sides also had previous World Cup experience, except for Russia who appeared in a Rugby World Cup for the first time. The following 20 teams, shown with final pre-tournament rankings, qualified for the final tournament. The 13 venues for the 2011 Rugby World Cup were confirmed on 12 March 2009. A number of the venues were redeveloped to increase capacity for the event. The Government considered passing a law bypassing the consent process to allow all the stadiums' redevelopment to be completed in time. 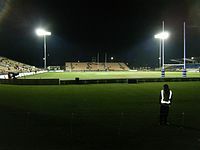 Due to damage to Stadium Christchurch and many other facilities in Christchurch caused by the earthquake on 22 February 2011, it was announced on 16 March that the matches to be played in the city would be relocated. The two quarter-finals scheduled would be moved to Auckland, while the five pool matches moved to other centres. 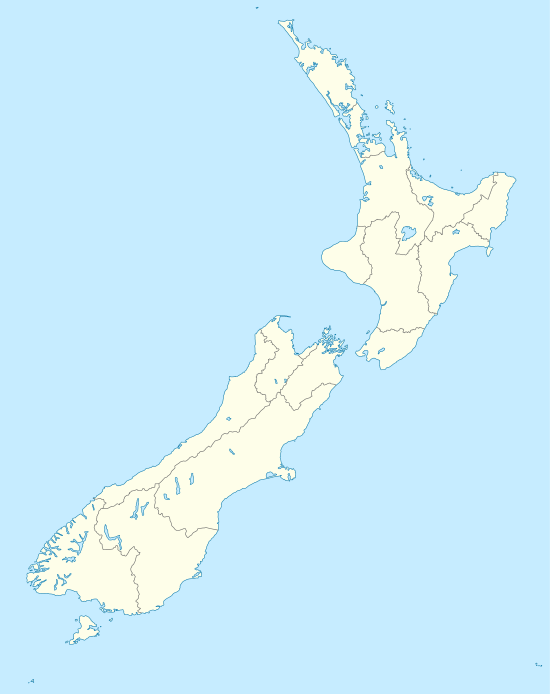 On 10 November 2006, the New Zealand Government announced plans for Stadium New Zealand in Auckland. The proposal was to build the new stadium seating 70,000 on the waterfront. After much public outcry, and lack of support from the Auckland Regional Council, the proposal was dropped in favour of the redevelopment of Eden Park. The redevelopment of Eden Park's Southern and South Western stands was completed during 2010. Dunedin's new stadium, Forsyth Barr Stadium (known as Otago Stadium during the tournament), was completed in August 2011 and was used instead of Carisbrook. Seeding of teams for the 2011 World Cup was based on their respective IRB World Rankings. The top four at the 2007 Rugby World Cup (South Africa, England, Argentina, and France) were not therefore allocated top pool spots, but "the rankings are now very well established and provide us with a credible and succinct way of seeding teams for the rugby World Cup pool draw", according to Rugby World Cup Ltd (RWCL) chairman Syd Millar. The draw was conducted in December 2008 and used the World Rankings as of 1 December 2008, after the Northern Hemisphere Autumn internationals. The teams were placed into three bands depending on their seedings at the time, with one team from each band in each of the pools. The rankings and bands were therefore: New Zealand (1), South Africa (2), Australia (3) and Argentina (4); Wales (5), England (6), France (7) and Ireland (8); Scotland (9), Fiji (10), Italy (11) and Tonga (12). The full draw and venues for the tournament were announced on 12 March 2009. The opening match saw the hosts, New Zealand, take on Tonga. By coincidence, the final match and third-place playoff match were between the countries which contested the same matches at the first Rugby World Cup, which were also held in New Zealand, in 1987. Each country was allowed a squad of 30 players for the tournament. These squads were to be submitted to the International Rugby Board by a deadline of 22 August 2011. Once the squad was submitted a player could be replaced if injured, but would not be allowed to return to the squad. There is also a stand-down period of 72 hours before the new player is allowed to take the field. Hence, a replacement player called into a squad on the eve of a game will not be permitted to play in that game. On 8 April 2011, the IRB named ten referees, seven assistant referees and four television match officials to handle the pool stage games. Two of the seven assistants will also be reserve referees if required. The first round, or pool stage, saw the twenty teams divided into four pools of five teams using the same format that was used in 2003 and in 2007. Each pool was a round-robin of ten games, where each team played one match against each of the other teams in the same pool. Teams were awarded four points for a win, two points for a draw and none for a defeat. A team scoring four or more tries in one match scored a bonus point, as did a team losing by seven or fewer points. The teams finishing in the top two of each pool advanced to the quarterfinals. The top three teams of each pool have automatically qualified for the 2015 Rugby World Cup. Official IRB World Rankings as of 3 October 2011. France vs Tonga at Regional Stadium, Wellington. Tonga won 19–14. Georgia vs Romania at Arena Manawatu, Palmerston North. Georgia won 25–9. Australia vs USA at Regional Stadium, Wellington. Australia won 67–5. 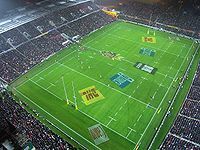 Sky Network Television, New Zealand's largest subscription television provider, was host broadcaster for the Rugby World Cup, transmitting all matches live and in high definition coverage was available. Games were also available on free-to-air networks in New Zealand but not all pool matches were screened live on free to air. Broadcasting rights were allocated throughout the world by the IRB, including highlights, free to air and pay per view. Paul, Gregor (20 November 2005). "An anatomy of the World Cup vote". The New Zealand Herald. "Govt: We want waterfront, tell us your views". NZPA. 10 November 2006. ^ "All Blacks survive scare to clinch Cup". rugbyworldcup.com. International Rugby Board. 23 October 2011. Archived from the original on 24 October 2011. Retrieved 24 October 2011. ^ "2011 Rugby World Cup Results". ESPN Scrum. Retrieved 20 February 2013. ^ "Christchurch loses all RWC games". The New Zealand Herald. 16 March 2011. Retrieved 1 September 2011. ^ "Rugby World Cup 2011". New Zealand Ministry of Foreign Affairs and Trade. Retrieved 1 September 2011. ^ Dickison, Michael (23 November 2011). "Rugby World Cup visitor numbers put at 133,000". The New Zealand Herald. Retrieved 23 November 2011. ^ Hembry, Owen (20 August 2011). "Here come the Cup fans". The New Zealand Herald. Retrieved 1 September 2011. ^ "Final date for RWC 2011 revealed". allblacks.com. 24 July 2007. Archived from the original on 30 September 2007. Retrieved 25 July 2007. ^ "Twenty teams to compete at Rugby World 2011". rugbyworldcup.com. International Rugby Board. 30 November 2007. Archived from the original on 26 July 2010. Retrieved 24 August 2008. ^ a b "Qualifying changes for 2011 RWC". BBC. 10 May 2007. Retrieved 24 August 2008. ^ Japan later succeeded in its aim to host a Rugby World Cup, when in 2009 it was awarded the 2019 Rugby World Cup. ^ McNaughton, Maggie (24 August 2007). "World Cup 2011 tickets won't come cheap". The New Zealand Herald. ^ Orsman, Bernard (14 June 2011). "Ratepayers to pick up $900,000 tab for giant TV screens". The New Zealand Herald. Retrieved 13 June 2011. ^ a b Gower, Patrick (13 December 2008). "Deadline fears for stadium". The New Zealand Herald. Retrieved 7 August 2011. ^ Hartevelt, John (2 February 2010). "Fears Auckland won't cope with World Cup". Stuff. New Zealand. Retrieved 7 August 2011. ^ "Auckland Transport "Will Be Ready" For Rugby World Cup 2011". Voxy.co.nz. 2 February 2010. Retrieved 7 August 2011. ^ McCracken, Heather; Lewis, Rebecca (June 2010). "Rugby World Cup strike risk". The New Zealand Herald. Retrieved 7 August 2011. ^ Loughrey, David (6 August 2011). "Stadium opened amid celebrations". Otago Daily Times Online. Allied Press. Retrieved 7 August 2011. ^ "RWC 2007 – Standings". irb.com. Archived from the original on 17 August 2008. Retrieved 24 August 2008. ^ "RWC 2011 fixtures and pool venues announced". rugbyworldcup.com. International Rugby Board. 12 March 2009. Archived from the original on 16 March 2009. Retrieved 12 March 2009. ^ "Rugby World Cup press release on Christchurch matches". Television New Zealand. 16 March 2011. Retrieved 16 March 2011. ^ "Carisbrook 'on track' for cup games". Otago Daily Times. Allied Press. 4 March 2009. Archived from the original on 6 March 2009. Retrieved 12 March 2009. ^ a b c "Rankings to determine RWC pools". BBC. 22 February 2008. Retrieved 24 August 2008. ^ a b "IRB World Rankings at 1 December 2008". Irb.com. 1 December 2008. Retrieved 7 August 2011. ^ "IRB World Rankings used for RWC 2011 draw" (Press release). International Rugby Board. 22 February 2008. Archived from the original on 26 February 2008. Retrieved 28 February 2008. ^ "RWC 2011 pools and match schedule". rugbyworldcup.com. International Rugby Board. 12 March 2009. Archived from the original on 16 March 2009. Retrieved 12 March 2009. ^ "Initial RWC squad named". Jrfu.org. Retrieved 9 October 2011. ^ a b c d e "RWC 2011 Selection" (PDF). irb.com. International Rugby Board. 8 April 2011. Archived from the original (PDF) on 19 May 2011. Retrieved 11 April 2011. ^ "Official RWC 2011 Site – Tournament rules". Rugbyworldcup.com. 3 October 2011. Archived from the original on 10 October 2011. Retrieved 9 October 2011. ^ "Top 5 Players of RWC2011". International Rugby Board. 24 October 2011. Archived from the original on 12 November 2014. Retrieved 26 October 2011. ^ "Where can I watch RWC 2011?". IRB. 2 January 2011. Retrieved 12 September 2011. Wikimedia Commons has media related to 2011 Rugby World Cup.